Brat Days is this coming weekend in Sheboygan, WI. If you are in the area, I highly recommend trying it out, Alexis and I had a wonderful time in that lakeside town last year. 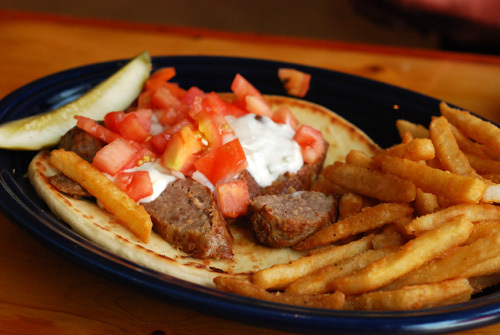 One of the exceptional meals that we had there were gyros made from brats, a special that Alexis got at Brisco County Wood Grill. The idea seemed a little weird but it tasted surprisingly like real gyros and she loved them. I've made gyros from scratch before with lamb and beef using Alton Brown's method on a rotisserie. They are good but a bit of a pain to make, not something you'd want to cook on a weeknight. 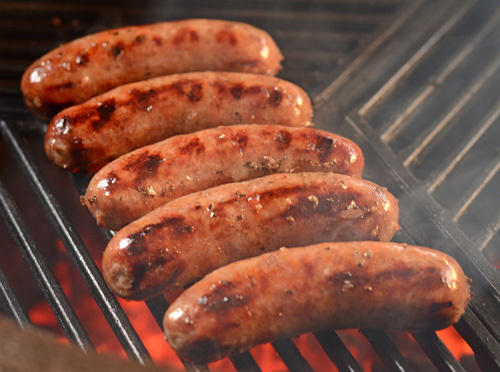 Brats are an easy alternative. Last night, I made my own brat gyros. I made a Greek version of Johnsonville's brat tub technique and a homemade tzatziki sauce to go along with it. 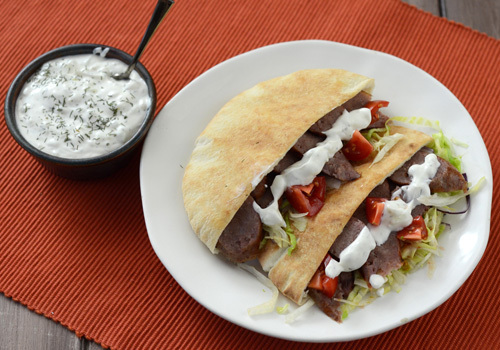 Mix the tzatziki sauce ingredients together in a medium bowl and refrigerate at least an hour before serving. Taste and adjust seasoning with additional salt and pepper as desired. Preheat a charcoal grill to medium low (300-325f). 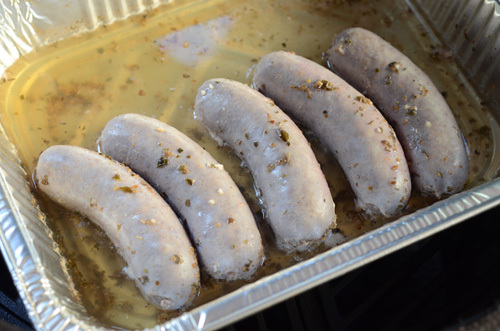 Place a half steam pan or a piece of stoneware on the grill with the beer, Greek seasoning, and the brats. Cook for 10 to 15 minutes, turning a few times. 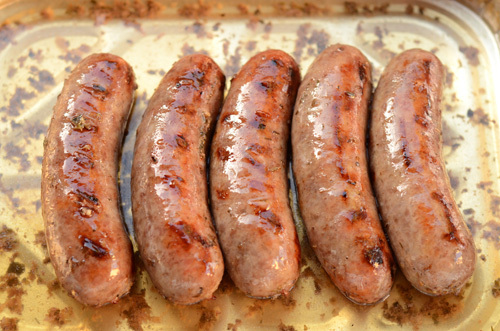 Move the brats from the pan to the direct grill and grill them until well browned (about 12-15 minutes), turning frequently. Each time I turn them, I put them all back in the pan for a dip. Toast the pita pockets on the grill for 10 seconds a side. Slice the brats on a 1/4 inch bias. 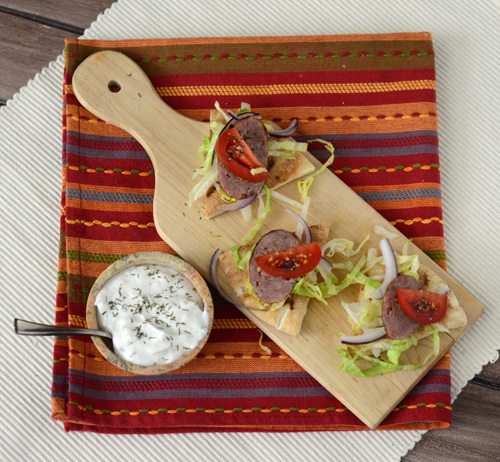 Serve pita pockets stuffed with lettuce, red onion, tomato, and slice brats with tzatziki sauce. 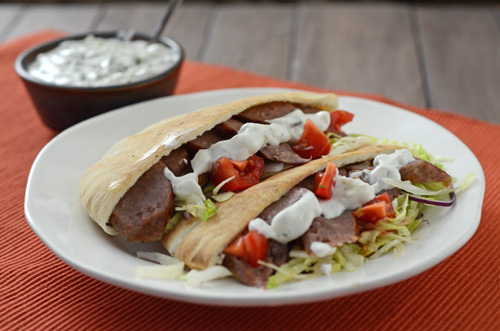 These are only made with premium cuts of pork but these brats do a good job substituting for the lamb/beef mixture of gyros. 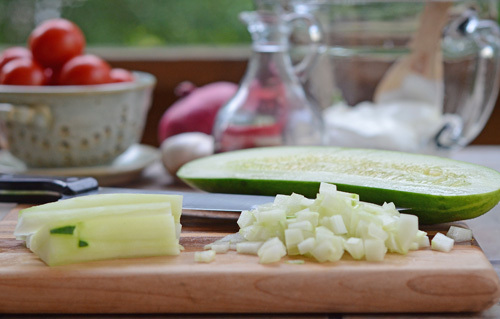 If you like a less coarse tzatziki, give the cucumber a spin in a food processer. 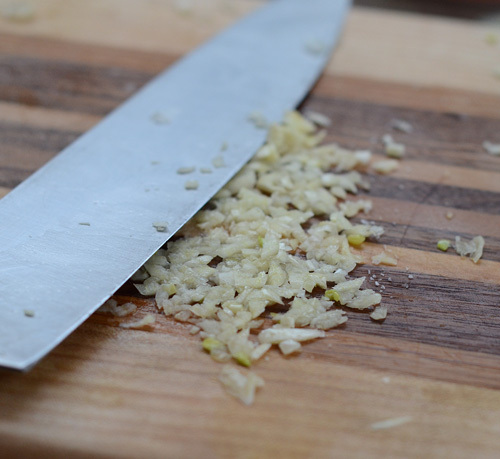 I like to sprinkle a pinch of salt on the cutting board and then crush my minced garlic with the knife blade. This releases the flavorful oils and starts the seasoning process. The brats will turn greyish during the simmer, don't worry. We will add color over the direct heat. Going back and forth from the bath to the direct heat keeps building flavor and cooks the brats gently so they don't split. You can also turn this into an appetizer but cutting the pita pockets into thirds and serving these as gyro bites. 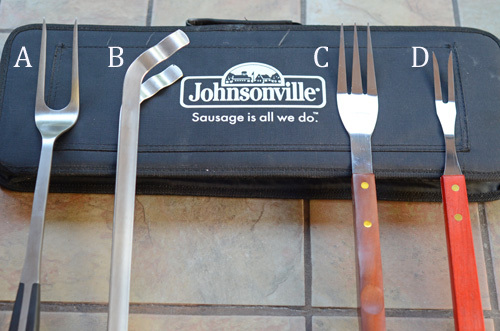 Quick pop quiz - which of the following grilling accessories is appropriate for turning brats over glowing coals? If you answered A, C or D, you made the Brattender cry. The face of all things brat, the Brattender has made a spoof video like an ’80s love ballad ala Micheal Bolton to bring awareness to this brat abuse. 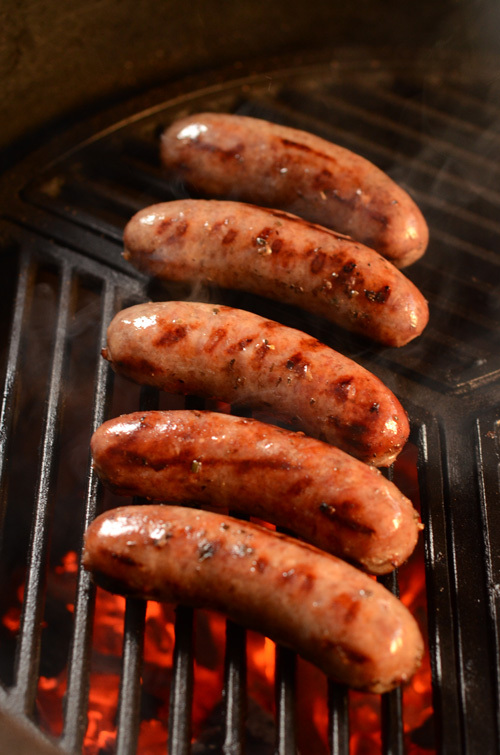 Piercing the outer skin of a brat while grilling releases the meat’s juices, leaving it dry. I like it when people can make a complete dork out of themselves for fun and entertainment. The line "like a flavor butterfly in a meaty cocoon" had me in tears (of laughter....not like SPCA/Sara McLachlan kind of way). Johnsonville is hosting the Ultimate Karaoke contest from now until August 30th and you could win $5,000 and a year's supply of brats. 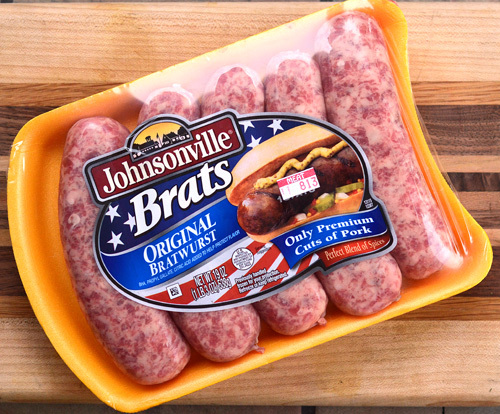 To enter, log on to Johnsonville’s Facebook page to download the “Don’t Pierce the Brat” song lyrics and music video. There they can create their own video and upload it to the Facebook application. People who can’t carry a tune need not worry—style, creativity and passion are the main criteria for a winning entry. Personally, I fall into the "can't carry a tune" category so I won't inflict needless pain and suffering on you all with my singing. But I'd love to see one of you win that $5,000. [Standard Disclaimer] I have an ongoing partnership with Johnsonville and receive occasional trips, free products, and other compensation as part of that partnership.